I second the advice on strengthening. After a brief period of long days I had RSI in (mostly) my right forearm. It stayed with me for years, despite attempts at strengthening using a silly little dumbbell (the advice of a physical therapist). What really did the trick was body-weight strength training, e.g. TRX. I haven’t felt pain or aches anywhere since I started strength training a year ago. Great article! I also had severe RSI, which I eventually overcame in similar way. I also switched to an ergonomic keyboard, and I’m using a pen-like mouse. However, for me the most important component was to start using a break program. I get so into programming that I completely forget to take breaks, so the break program is crucial for me. I’ve written about my experience here and I have also reviewed different Mac break programs here. • ErgoRest Arm Rests. These helped me a ton with both my wrists and my shoulders/back. They’re a bit expensive, but they perform the function of the foam rest in your setup, are height adjustable, and allow a free range of movement. These made more of a difference than any other thing in my setup. I no longer have back and shoulder problems due to these. The people in my office call them my robot arms. • Kensington Expert Mouse. Combine the arm rests with a trackball that has no wrist rest and you don’t ever need to bend your wrists when “mousing”. 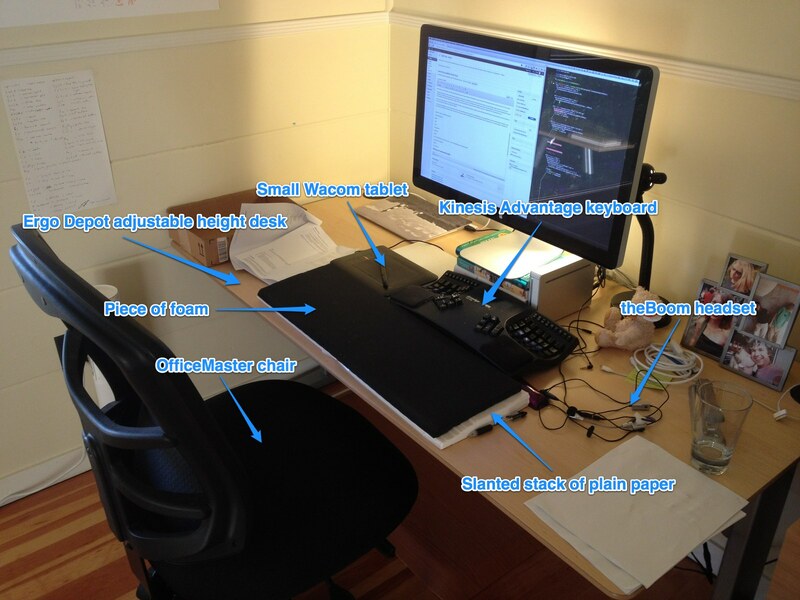 • I don’t have an adjustable height desk, but I raise my seat up to the correct level and use a raised, adjustable foot rest so I can keep lower body aligned properly. This is a new thing for me, but it seems to be good. More than anything else, consider the ergorest arm rests. It’s not an exaggeration to say that they’ve saved my career. If you’re in SF and want a demo, hit me up on twitter and we can arrange it. I need to consider getting another keyboard, I’m using a mac keyboard for most of my work right now and I still get wrist problems if I have a heavier day for typing. I’ll check out the kinesis. When I was still a student, I could already feel the first onset of RSI. Regular exercise and healthy habits go a long way. But I also wrote AntiRSI to help me. That original version is still free, and there is an enhanced appstore version. If you are a heavy computer user, using a break program can really help. I would encourage you to investigate the options and choose what fits your habits best. Great article. I will admit that I haven’t cured my RSI and I’ve had it for over 6 months with previous years showing signs. I’ve also had to resort to a typist (I’m a Product Manager) to dictate to since all the programs available simply aren’t as robust. Advice for those have tried “everything” (40+ sessions across 6 specialists) but have not fully recovered. • Stop friggin typing (as I’m doing now…). • Stay away from Tomatoes, eggplant, and peppers. They cause inflammation (my RSI is in my forearms and elbows). • Try ART (Active Release Therapy), Prolotherapy, Biopuncture, and lastly Platelet Rich Plasma (bring on the needles!). aerials25: I don’t know your situation, and am not trying to make light of it, but let me just make a comment. First, I don’t think it’s valid to offer advice, especially about painful or invasive treatment, before you have recovered yourself. The case is not closed. Second, a lot of those treatments you have tried are contradictory (e.g. induce inflammation vs. reduce it), many posit structurally unverifiable mechanisms (e.g. permanent microtrauma), and some sound literally crazy. Have you considered whether you have a psychosomatic preoccupation? Very high healthcare utilization without any result is a strong indicator, as well as finding temporary relief from each new novel treatment. Have you read any of the Sarno books? Have you tried putting the keyboard across your legs (i.e., essentially in your lap)? I’ve been typing that way for many years now and find it by far the most comfortable. A chair with no arms (as you also prefer) is essential for that. Terry: Good suggestion, if I want a change up some day I might try it. evan: Thanks for your note. I’m not familiar with Sarno. I’ll follow up in private! I wish you had written this article years ago. It took me far too long to realize that my pain was caused by the complex set of factors that you outline here. Do you have any tips for ergonomics while away from home with a laptop? I’d love to pack my Kinesis but it’s just too huge. I already prop the laptop up on something to bring it closer to eye level. evan2m: You could try leaving the laptop as-is, and instead focus on getting your upper body exercise daily when traveling. Great article, Evan. I too work in IT and play Xbox, and have suffered on and off with RSI. I would second/third/fourth what you said about strength (Your Shape is great for this) and have also used the Wacom tablet. I also found far too many gimmicks online so I wrote my own series on the subject in the hope it might be a help to others. This also includes a couple of other gadgets people might find useful. I would also be grateful for any comments. If it gets bad and it is mouse related you could always start using the other hand. It only takes two weeks to become fully dexterous. In effect you half the mouse workload. That in conjunction of having a setup where your wrists are straight can be a big improvement. One thing to try for hand/forearm pain is an Evoluent Verticalmouse. I bought one after pains in my forearm and the top of my hand. Took a couple of days to get used to the vertical mouse, but my forearm is not twisted and haven’t had any pain at all since. That was 3+ years ago. ficklelife: I tried that mouse back in the day and found it excruciating. But if it works for you, it works. I suffered from sciatica for a while because of spine compression. Extending the angle between my trunk and my legs (reclining the chair and abandoning the straight back advice) sorted me out as it reduced the pressure on the lower back. The most important thing with any structural pain is to get an accurate diagnosis of what’s causing it so you can attempt to fix it. I’ve been using Kinesis Advantage keyboards for 6 years, and a Bamboo Fun for 4, that’s the best thing that ever happened to my hands after I got a pretty severe RSI (like, impossibility to open a door, cook, etc). Using a Dvorak based layout (bépo, in my case) also proved useful. I bought a truck without power steering. This worked for me.